Many years ago, as a new believer, I had the opportunity as a nurse to take care of a highly esteemed Rabbi that had surgery. Since I was personally assigned to him, we had many hours to talk and to my delight, he enjoyed talking about Scripture. One topic we spent time talking about was the topic of the Jewish holidays. Even in my fresh Christian mind, I immediately saw the connections between the feasts and God’s plan for humanity through Christ. This made me appreciate how God reveals His plan for humanity in so many ways. An overview of Jewish holidays will help us to understand part of God’s plan. What are common Jewish holidays? Purim: A holiday that is celebrated 30 days before Passover to commemorate the defeat of a plot to exterminate the Jewish people while they were living in Persia. It is celebrated with public readings of the book of Esther while blotting out the villains name for the story line. It is known in Jewish circles as a popular holiday celebrated with costume parties, eating fruit-filled triangular cookies, and drinks (1). Chanukkah: A holiday that is celebrated to commemorate the re-dedication of the Temple after it was defiled by the Greeks. It is celebrated by lighting candles over a period of eight days to remember a miraculous event when there was only enough oil for a Menorah to burn for one day, but instead, the oil lasted eight days, giving the Jews time to prepare more oil. During this time, fried food is eaten and dreidels, commonly known as a top are played with (2). Passover: Also known as Pesach, is a holiday that is celebrated to commemorate God’s protection of the Jews and freedom from the plague of death at the end of over 400 years as slaves in Egypt (Exodus 1-15) (3). It is observed on the first full moon of the Biblical year as a feast of freedom. It was celebrated by sacrificing a lamb and painting the top and sides of the doors with the blood so that death would pass over that house and all who lived inside. It was later celebrated by sacrificing a lamb and eating the meat as part of a meal known as a Passover Seder. This feast was literally fulfilled by Christ, who was sacrificed for the sins of the world as our Passover lamb so that death would pass over those who have trusted Him as their Savior. The Feast of Unleavened Bread: This feast starts at the same time as Passover, but continues for seven days as commanded by God in Exodus 12:15-20 (4). During this time, no grain based bread with leavening or yeast was eaten. Instead, unleavened bread, or matzo, was eaten and recognized as the bread of affliction (Deuteronomy 16:3) to commemorate leaving Egypt quickly without allowing time for their bread to rise. Since the Bible compares leavening to sin, this feast represents the purging of sin from our lives (1 Corinthians 5:6-8). This feast was literally fulfilled by Christ when He purged us of our sins (Hebrews 1:1-3; Hebrews 9:19-22; Hebrews 10:1-6). The Feast of Firstfruits: This feast was observed on the first day of the week, Sunday, after the Passover. This day is also the day the Israelites first stepped foot on the opposite shore of the Red Sea as the “first fruits” out of Egypt (Exodus 14:21-31) (5). Later God commanded the Israelites to perform a sacrifice of the first ripened grains of the winter barley crop as the beginning of the harvest (Leviticus 23:9-14). This feast was literally fulfilled by Christ on the day of His resurrection as the “first fruits” from the dead by the Holy Spirit (Romans 8:23; 1 Corinthians 15:20-23: James 1:18). The Feast of Weeks: This feast, known as Shavuot, was observed on a Sunday, seven weeks after the Feast of Firstfruits (Leviticus 21:15-21) (6). This 50-day period is also where it got the name Pentecost, meaning 50 days. It is observed as the day that the Lord gave the Israelites the law at Mount Sinai, seven weeks after arriving on the opposite shore of the Red Sea (Firstfruits). This feast was literally fulfilled seven weeks after the resurrection of Jesus when the “Promise of the Father”, the Holy Spirit, was given to believers to write the law on their hearts (Acts 1:4; Acts 2:33). The Feast of Trumpets: This feast, known as Rosh Hashanah, was observed on the first day of the seventh month with the blowing of a ram’s horn trumpet, or shofar (7). This day is also known as the Jewish New Year when the Jewish people repented of the sins of the past and committed to making changes in the future. The blowing of the shofar connected this repentance with the calling of a solemn assembly with the announcement that the day of God’s judgement was coming (Leviticus 23:23-25; Joel 2:1; Zephaniah 1:14-16; Revelation 9:20-21). The blowing of the shofar consisted of a series of trumpet blasts, concluding with one long blast signifying the final call to assemble. Spiritually, this feast has yet to be literally fulfilled. We see a reference to this “last trump,” made in 1 Corinthians 15:51-57 and 1 Thessalonians 4:13-18 as the day of the resurrection and rapture of believers and the beginning of the final tribulation period of the Jewish people before the return of Christ. The Day of Atonement: This feast, known as Yom Kippur, was observed on the 10th day of the seventh month with prayer and fasting and a sacrifice for the sins of the individual against God (Leviticus 23:26-32) (8). It also contained a practice where the sins of the congregation were transferred to a “scapegoat” that was driven into the wilderness (Leviticus 16). It concluded what was started on the Feast of Trumpets with the final call to repentance. In the Jewish liturgy, the service was concluded by the congregants praying in earnest for forgiveness by God before the open Ark that contains the scrolls or Torah. Spiritually, this feast has yet to be literally fulfilled. However, it presents a picture of the culmination of the tribulation period and the return of Christ for the remnant of Israel awaiting redemption and sealing by the Holy Spirit (Revelation 7). Also, the driving of the scapegoat into the wilderness is thought by some to represent the casting down of Satan into a bottomless pit for a thousand years at the beginning of the millennial kingdom reign of Christ on earth after His return (Revelation 20:1-4). The Feast of Tabernacles: This feast, known as Sukkot, was observed for seven days starting on the 15th day of the seventh month (Leviticus 23:33-36) (9). It commemorated the time of wandering in the wilderness where the Israelites lived in temporary dwellings of booths and celebrated the harvest at the end of the year. It is commonly celebrated by Jews today with the building of a booth or temporary shelter in the back yard and decorating it with dried squash and corn from the harvest as well as other activities. This gave it a connection with the holiday of Thanksgiving. Spiritually, this feast has yet to be literally fulfilled. However, it presents a picture of the end of the wandering of the remnant Israel and thanksgiving celebration as Jews and Gentiles alike live during the glorious millennial reign of Christ and onward into eternity. As Christians we can study the Jewish holidays and see connections between the feasts and God’s plan for humanity through Christ. 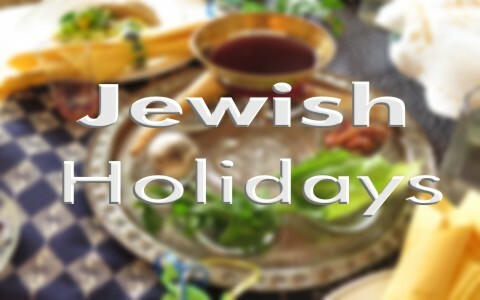 We see two general categories of Jewish holidays; those that are primarily observations of historic events and those that were given by God in the law as part of a sacred Jewish calendar. Those holidays, also called feasts, given by God in the law occur in the spring and the fall of each year based upon the sacred Jewish calendar which is different from our modern day calendar. According to Scripture all of the spring feasts have been literally fulfilled in Christ and the fall feasts point to a time in the future when Christ returns for His people. Looking at the Jewish holidays can help us to understand part of God’s plan. Read mores about Passover here: What Does Passover Mean to Christians? Previous post: Who Does The Bible Say Will End Up In Hell?